FIRST EDITION in English, beautifully illustrated with 104 plates (64 in full color), and TWO ORIGINAL COLOR LITHOGRAPHS done expressly for this edition. 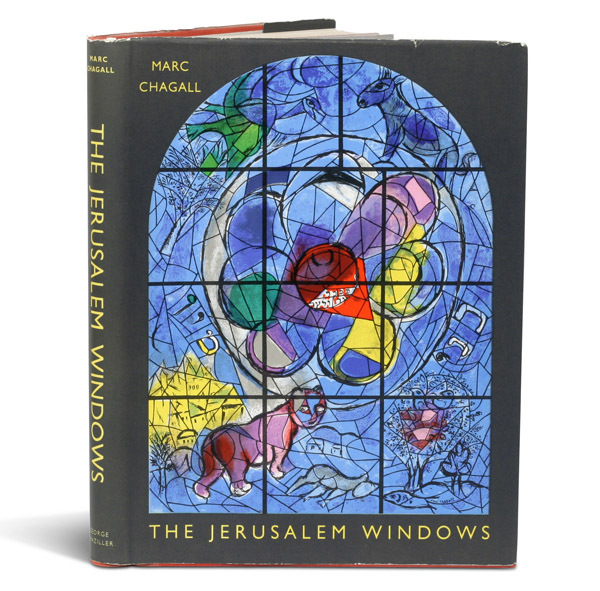 Chagall’s Jerusalem Windows illustrates and chronicles the creation of the famous twelve stained glass windows, one for each of the twelve tribes of Israel, designed by Chagall for the Hadassah-Hebrew University Medical Center Synagogue in Jerusalem. Text and Notes by Jean Leymarie. Original red cloth, original pictorial dust jacket. Without the rarely seen publisher’s slipcase. Book fine, dust jacket near-fine with only a little edgewear.